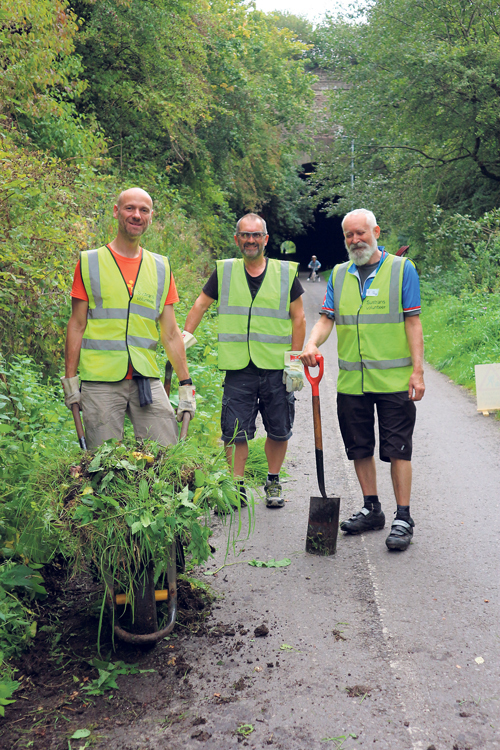 TEAMS of volunteers gave up a day to make the Bristol and Bath Railway Path a better place for everyone who uses it. The clean-up was organised by Bristol-based cycling charity Sustrans, which helped create the route nearly 40 years ago. Around 50 volunteers, some local and others from as far afield as Wales and the Midlands, picked up litter, cut back overhanging branches, repainted mileposts and reclaimed the edges of the path where grass and undergrowth had narrowed it by growing over the surface. They worked at several sites on the path, including Staple Hill and Mangotsfield stations, Fishponds and St Philip’s. Among the volunteers were Laura Williams and Sarah Ladkani, both from Staple Hill. Sustrans employees including south of England director James Cleeton, who lives in Fishponds, also took part in the clear-up. James said work was being done to improve the path ahead of a redesign to mark its 40th anniversary next year. The charity is inviting people who use the path, from leisure cyclists and commuters to dog walkers and pedestrians, to get involved with the One Path Project, along with people who currently feel they are unable to use it. To find out more about the One Path Project and have a say on the route’s future, call Sustrans on 0117 915 0119, email south@sustrans.org.uk or visit BBRPOnePath on Facebook.